My latest winter-skin hero: Heal Gel. Created by five plastic surgeons, it’s designed to help repair post-surgery skin (read chapped, inflamed, generally sore) as well as treat a whole range of different skin conditions. 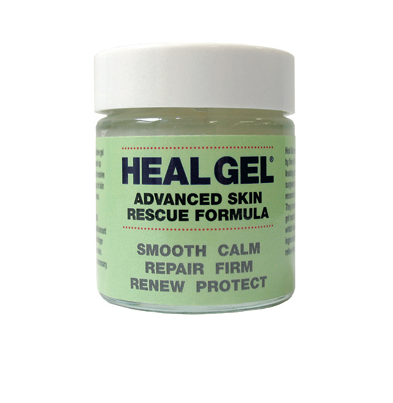 If you’re looking for a multi-purpose skin ‘first aid’ gel then this one is brilliant. So far I have used it on cracked, sore lips, red flaky patches around my nose and puffiness under my eyes – it has worked an absolute treat on all of them! Some of the conditions that Heal Gel claims to help: surgery scars, keloid scars, eczema, acne, psoriasis, puffiness, minor burns. It’s apparently even good for wrinkles, helping to increase collagen and firm the skin as well as protect it from the aggressors that can age it. The gel forms a protective coating on the surface of the skin so that the active ingredients can work unhindered beneath – the ingredients include peptides and amino acids to reduce inflammation and aid collagen production as well as arnica to reduce swelling. There are loads of other things that I don’t understand well enough to talk about, but what I do know is that this light gel provides instant, cooling relief and does appear to do exactly what it says on the tin! Just a thought; for those who have written to me asking what to put on sore upper lips after waxing incidents – THIS. Seriously.